Experienced instrument teachers and tutors will provide each pupil with continuous, individual support. 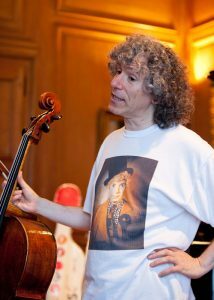 Internationally renowned master pedagogues will include Maxim Vengerov, Ivry Gitlis, Leonid Kerbel for the violin, Menahem Pressler and Rudolf Buchbinder for the piano, Vladimir Perlin and Jérôme Pernoo for the cello, Ronald Van Spaendonck, Annelien Van Wauwe for the clarinet, Catherine Michel for the harp… These classes, both individual and collective, would take place each month. 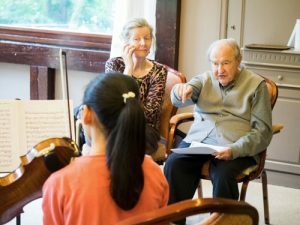 In addition, also once a month on average, the school will invite guest artists such as Janine Jansen, Gidon Kremer, Mischa Maisky, Fazil Say … to give masterclasses to be attended by all. 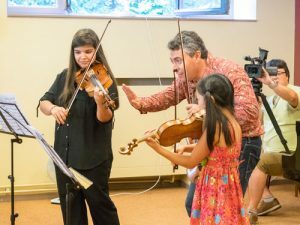 The work of a soloist will be at the heart of the teaching agenda, without neglecting chamber music and orchestral music. Individual work will be integrated into the daily timetable. It will be monitored, encouraged and supervised. Synergies will be developed with other high-level musical institutions in the world, making full use of partnerships already active thanks to twenty years of experience acquired through the Musica Mundi international course and festival.